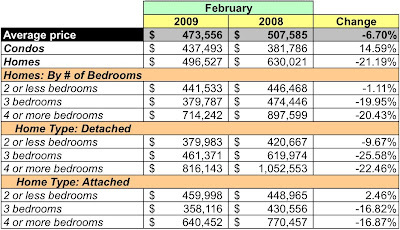 DC Home and Condo Prices: MRIS February 2009 Housing Report: Bleh! This will make for an interesting 2009. And thanks to his blog, I sit and wait and watch. At least three bedrooms, attached did better! Until District prices come down a lot, I don't believe the $8000 tax break and lower interest rates will make a huge difference on the demand side. Prices are still high. One bedroom condos in the District are in the $300-400K price range, which, in today's stiffer lending environment, will still require at least a 10% down payment and an income that will support the more conservative lending ratios [figure $100-133K / year]. If you look into the zip code stats, the high end zip codes are showing a huge glut of inventory. 20007 has a 22 month supply, 20008 a 15 month, etc. 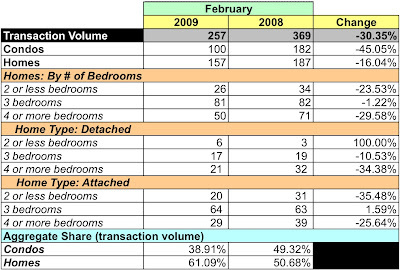 The supply levels in these zip codes has been trending upward for the past several months. 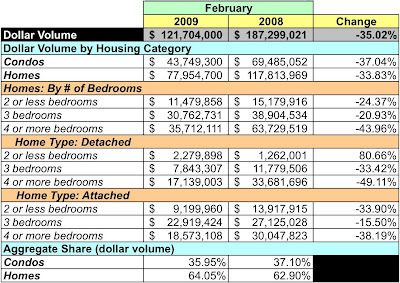 My guess is that these areas will see significant price reductions before the end of 2009.
what you are seeing is market seizure. nobody is buying, nobody will sell at that price. so, until someone flinches, it seizes. Just wanted to say I really appreciate all your effort on this blog - keep up the fantastic work. I am out in downtown Silver Spring and the prices here are still very high. However, there are dislocations in the condo market, I am wondering if housing prices are next? Anon 11:44, you're right about the MOI for the high-end zip codes, but it actually breaks down in different way for condos vs. houses, with houses not as bad as condos. I agree with your overall point, but I won't be surprised to see prices for condos in these DC zip codes fall way more than prices for SFHs. Your site is awesome keep up the good work. I agree. The analysis you provide is clear and helpful to understanding the current state of affairs in DC RE.